before you leave the world. The boys finally return from their four dreamy summer weeks on Georgian Bay (Canada) on Friday. Jeremy and I left them behind a couple of weeks ago, returning home on our own. The time has flown by as busy-ness with work, friends, and various projects–the ones that seem to never get done–have filled our days. Our major focus though, has been redesigning, painting and organizing the room of a boy who has gone from a child to a teen. Jesse starts high school in just 6 days. He had his first official job this summer and he earned his first paycheck. He went scuba diving for the first time just this very week. These are some wonder years, truly. Despite our natural propensity to want to keep him close, we’re making the changes to his room as a symbol of this new stage of his life. We’re acknowledging–with a mixture of wistfulness and excitement–that he’ll be taking more and more independent steps from here on out. 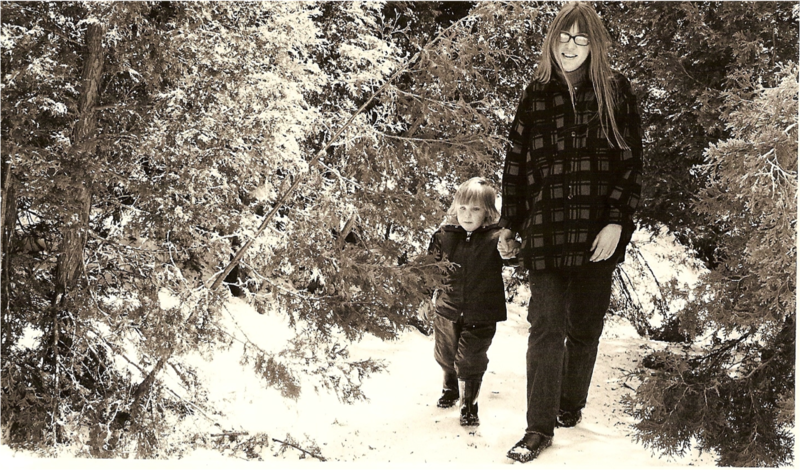 How do we let our eldest child–he who is so beloved–step out onto this new road? How do we let him walk through the big, unfamiliar doors of a school where he will surely be one of the youngest students? How do we simply watch him join the throngs of strangers, trusting that he will capably make his way through uncharted territory? We know that we cannot let our anxieties obstruct his eager progress. This is the natural way of life’s unfolding. This is what God intended for us to experience in the often difficult dance between intimacy and independence. So I deliberately don’t focus on all of the things that my boys will encounter on a daily basis that I simply cannot control. I try to trust and hope and let them be them. After all, they are pretty fantastic. And yet this is a novice’s attempt at faith and parenting and letting go when compared to the one soon to be faced by my new blogging friend–who just happens to live in Charlotte–Jennifer Richardson. Prayers for you, Jennifer. Prayers and peace across the miles, new friend. May I have such courage each and every time I too am tending into the turn. 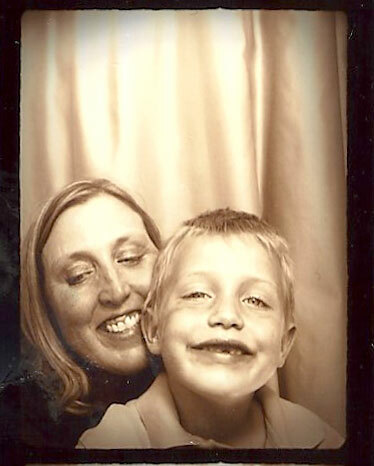 Dylan lost his first front tooth on Saturday. We were all so tired from Jesse’s 14th birthday (surprise karaoke party) that Dylan forgot to put his tooth under the pillow that night. So after Marlene’s wedding we came home last evening–yep, even more exhausted–and Dylan set to work busily writing a note on the bag holding his tooth. 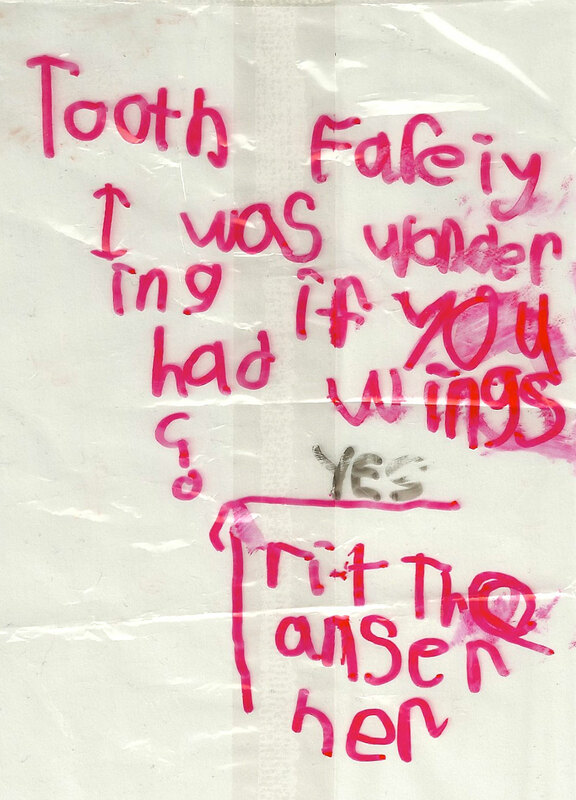 He was obviously very interested in solving one of the great mysteries of childhood: Does the tooth fairy have wings? Getting that rustle-y, crinkly little plastic bag out from under his pillow and putting it back without waking him up was a challenge, I can tell you. Love that boy. And the other one we have too. Thanks for reading! Click here to subscribe to this blog and receive notifications by email whenever I post something new.